The Pisces dreamer and Aries warrior make an interesting mix. There is plenty of intrigue and steamy attraction. But in order for these two very different signs to co-exist, some serious adjustments will need to be made. Venus in Pisces is not always sure who she wants, but she’s willing to explore the options. Partnerships begin in a haze of delight because she relates by bringing her romantic dream to life. She wants that idealistic love so much that she’s on a never-ending quest to find it. This can result in confusion about who and what make her happy. It can also result in disappointment if her lover fails to match the dream. 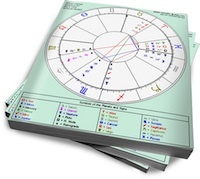 However, in the right relationship Venus in Pisces can be truly selfless as she tunes in to her partner’s desires. Mars in Aries knows exactly what he wants. Dynamic and aggressive, he is the suitor who charges in and claims the object of his lust. There is no second-guessing with this passionate force of nature. A demanding lover, he does best with a partner who puts his needs first. While he can be impatient, Mr. Aries is turned on by the thrill of the chase. If things are too easy, he’ll get bored and move on. Mr. Aries will find Ms. Pisces to be a delicious challenge. He’ll be fascinated by the idea that she might drift away at any second. Ms. Pisces may vacillate between interested and unavailable, depending on how she’s feeling at the moment. If they do get together, Pisces will accommodate Aries’s demands (initially) but will quickly get overwhelmed by his energy. For his part, Aries will become impatient with Pisces’ sensitivity when he bluntly expresses his opinion (or loses his temper). In order for this pairing to work, Mars in Aries will have to develop some patience and sensitivity. Venus in Pisces will need to strengthen her porous boundaries so her partner doesn’t trample them. The positive potential of this relationship can look like this: Mars in Aries protects his sensitive Pisces lover while she anticipates his needs before he’s even aware of them.